Villa Gracisce is a large old stone house with two large bedrooms with en-suit bathrooms, large lounge room with two beautiful terraces and fully equipped rural-style kitchen with an outside space and ten-meter salt-water pool. Villa Gracisce is a perfect spot for the family and friends to spend some quality time together by the pool or on the netball pitch, but also ‘escape’ individually with a book or a yoga mat in one of the many quite corners. The ground floor of the house consists of a large stone-floored living room and separate high-ceiling kitchen with traditional Istrian fire place. Two west-facing balconies offer outdoor dining and an area to relax, with the addition of a table-tennis table and an adjacent badminton/handball court. Upstairs bedrooms with wooden floors have en-suite bathrooms. Air conditioning is based in the top bedroom covering upper floors. With the addition of a salt-water pool (9.5m x 4.5), surrounded by smooth stone flagstones, wooden decking and grass, the house offer an opportunity for a perfect, secluded home from home. The property blends superbly with the surrounding hues of green and beige, creating a harmonic atmosphere. Unlimited wireless internet contributes making our house into "Il Posto" - switch it off if you need a real holiday or come and work all year round from a tranquil and secluded Istrian spot! Extras: yoga mats, organic bio-dynamic, locally grown, seasonal vegetable delivered to your doors! We discovered the village some fifteen years ago and committed ourselves to slow and sustainable refurbishment, using a passive approach to construction which includes recycling and preserving the stone walls, roof tiles and lime facade. This 'Zen' approach to space, combined with traditional architecture, resulted in an open and inviting Istrian environment that allows its visitors to feel at ease as soon as they arrive to the place. The house was originally built close to 200 years ago and was a central property in a cluster of six houses that made an old village of Marcani. It took us some years and a lot of patience to bring two of the houses back its original beauty (our home, the other house, is across the courtyard). We tried to use original materials and make houses as passive as possible. We also merged the stable that was originally standing next to the house and turned it into a kitchen. Parts of the ruined walls were preserved and turned into two terraces which now provide atmospheric intimacy. Istria is famous for its openness and harmony among people that live there. This is reflected in the Istrian's landscapes that are wide open and not blocked with high walls. We tried to achieve the same around the house with the soft boundaries of trees, bushes and rockery. Many places to hang around find your personal spot! If you are looking for the Tuscany and Provance of the 1960’s, with amazing gastronomy, stunning nature and private beaches, Central Istria is the place for you. From film festivals to jazz festivals; simple eateries to Micheline star restaurants; sandy beaches to secluded bays: Istria offers variety for individual and family visitors which is unique in the Mediterranean. Located in the heart of Istria, the medieval village of Gracisce spreads itself over a hilltop with beautiful views and stunning nature, allowing its visitors to enjoy complete tranquility. Once stationed there, visitors have the advantage of being within 30 minutes drive from most of the major sites. Gracisce prides itself with one of the oldest walking routes in the former Austro-Hungarian monarchy, spreading over rolling countryside with beautiful natural sights such as the 'Slap' waterfall and several abandoned hilltop churches. All bathrooms are en-suite to the bedrooms, and are original creations of a local artisan - containing unique elements in keeping with the Istrian environment. There is also a separate toilet on the ground floor and outside shower for the pool area. Air conditioning is available at the top floor covering bedrooms. Under-ground heating in the leaving room and kitchens is installed under the stone floor and connected central system partly powered by the fireplace. Bedrooms and bathrooms are all heated. Linens are provided and can be changed upon request. Washing machine with accompanied washing powder is provided in each house. Dedicated area for outside clothes drying is provided. Fireplace was hand made and creates an excellent companion in early spring and late autumn, as well as can be used for the barbecue during summer. There is a dedicated parking space in front of the house. Bathroom, as well as pool towels are provided. Outside table tennis, badminton and basketball hoops, as well as swimming pool. Living rooms are individual and provide a secluded place for evening reading away from it all. Illy coffee machine; supply of capsules provided. Spacious kitchen with high ceilings, grand open fireplace hand-crafted by local artisan. Wooden, custom-made furniture. 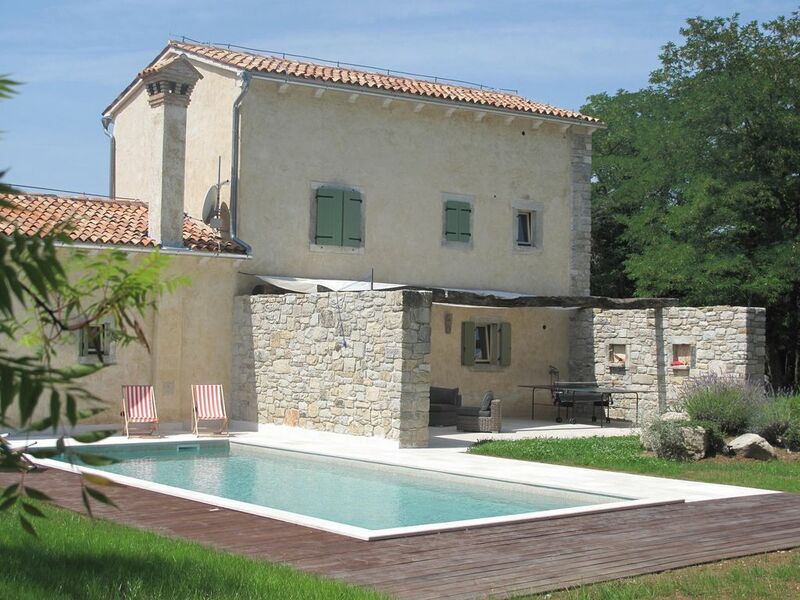 Stone floors, access to terraces with table & chairs and pool area. Kitchen has a large open fireplace that can be used for barbecues and terraces for outside dining. Stereo equipment with connection for your iPod/iPhone in the living room. A selection of books about the area, as well as books published by Istros Books, our publishing house based in the UK, covering new and upcoming writers from Croatia and the region on offer. 'Game Room' is all around the house - from basketball hoop, badminton/volleyball playground, table tennis to a swing. Plenty to do when you get bored of swimming in the pool! Garden and rockery around the pool provides intimacy from the neighbors. Stone balcony adjacent to the main bedroom. Each house has beautiful terraces protected by refurbished stone walls which were once part of the original house are providing a perfect area for dinners and drinks. Sauna is available in our house during low season and winter months. 5x9.5m pool with salty water positioned between two terraces makes you wanna hang around and do nothing else! Pool furniture with towels provided. Night swim with underwater lamps. Notes on accommodation: Property can be reached only by car. Keys will be handed to you by neighbours. **Due to the nature of the stairwell and the open pool area, this property is not suitable for children under 5 Outside: One large sun terrace from the living room with lounge chairs and coffee table, and a terrace with dinning table and chairs leading from the kitchen. Tended garden with rockery and green lawns. Main bedroom has large stone balcony. Access to a private swimming pool from both living-room and kitchen terrace. The swimming pool is 9.5x5m and is salt-water. Pool lighting for evening swimming and deck chairs in situ. The surrounding countryside is home to small farmsteads and wine producers. Utility Rooms: At the entrance to the property there is a separate utility room with washing machine. Cleaning / Towels / Linen / Maid service: You will find the property clean and fresh when you arrive, with beds made and all towels and linen provided. We do provide wonderful pool towels but please bring beach towels. Other: Wireless access available on request. Four second-hand bicycles (one child's) available, suitable for short journeys. Yoga mats for loan upon request. Sunny memories of our family’s stay at Villa Gračišće in Istria last summer will light up any gray day. This beautifully refurbished old stone farmhouse comes with all the modern amenities you could wish for, and was roomy enough to accommodate our family of different generations without anyone tripping over each other. The owners of Villa Gračišće were exceptionally helpful and their tips opened up a world that no guidebook can do justice to. When not lazing by the pool, we spent our days exploring the stunning countryside, alternating between visits to ancient hilltop towns and villages and the inviting beaches along the beautiful Adriatic coast. And then there was the food! There are wonderful, small restaurants wherever you turn. This is truffle country, and there are oh so many ways to enjoy them without having to break the bank. When we opted for fish, it was fresh and straight from the sea. The pasta dishes were homemade. At home, we enjoyed fresh vegetables and fruit from local farmers. We spent many a long evening on one of the house’s patios, gazing at the stars, sipping some of Istria’s famous yet affordable wines and thinking: Life is good. And at Villa Gračišće it certainly is. Wir waren Anfang Juli 2015 mit fünf Personen in der Villa Gracicse. Es waren zwei wundervolle Wochen. Das Haus ist ein Traum und noch viel schöner und vor allem großzügiger, als es die Bilder vermuten lassen. Die Zimmer sind toll eingerichtet und vor allem super-geschmackvoll gestaltet. Das Dachzimmer mit dem angeschlossenen Bad ist allerdings etwas niedrig und sicherlich nichts für Zwei-Meter-Menschen. Meine Frau und ich haben dort geschlafen und es war völlig ok. Vor allem, weil man sich im Urlaub ja sowieso eigentlich nur nachts im Schlafzimmer aufhält. Das Dachzimmer hat eine Klimaanlage! Sehr praktisch! Man kann sie abends zwei Stunden anschmeißen und hat dann die ganze Nacht über angenehme Träum-Temperaturen :-) Überhaupt muss man sagen, dass wir die gesamte Zeit über tolles Wetter hatten, fast immer über 30 Grad, - uns es aber nie unangenehm zu heiß wurde. - Pool, Terrassen, Garten... alles ist wirklich traumhaft. Und auch die gegenüberliegenden Häuschen passen idyllisch ins Gesamtbild dieses wunderbaren Fleckchens Erde. Ich wünschte, das Haus würde mir gehören :-) Wer Zweifel wegen des Salzwasserpools haben sollte, dem sei gesagt, dass die völlig unbegründet sind. Wir hatten diese Zweifel anfangs auch und müssen nun sagen, dass so ein Salzwasserpoool tausendmal schöner ist, als gechlortes Wasser... Wirklich! Das Haus ist mit allem ausgestattet und lässt eigentlich keine Wünsche übrig. Wer allerdings ungern das Geschirr mit Händen spült, der sollte bedenken: Es gibt keine Spülmaschine! Für uns war das überhaupt kein Problem! Außerdem bekamen wir so unsere drei Teenager mal "an die Arbeit"...:-))) Vom Haus aus sind alle Küstenorte in 40 bis 50 Minuten zu erreichen. Wir haben oft den Tag am Pool verbracht und sind dann gegen Abend nach Rovinj, Porec, Rabac,, Labin, Novigrad, Pula oder auch Vrsar gefahren. So haben wir viel von Istrien sehen können. Der Vermieter ist übrigens eine Wucht und super freundlich und zuvorkommend. Das sollte hier unbedingt mal erwähnt werden. Schon im Vorfeld des Urlaubs hat er uns mit vielen Tipps versorgt und alles für uns getan. Das ist wirklich toll gewesen! Danke Vlaho! This summer, fate put in our path this charming village in Croatia, called Gracisce, where we stayed in a magnificent villa, also called “Gracisce”. The Villa is restored lovingly by its owners with an eye for stylish simplicity, which is rarely found. The textures, decorations, design solutions and colours are all traditional and charming. It allows wonderful space in bedrooms, kitchen and living accommodation. The kitchen is fully equipped for anything you may want to cook. The swimming pool, the table tennis, the volleyball net, the many outside sitting areas allow for a variety of experiences. The fact that the villa was situated just outside the village of Gracisce (1 km), gave us the opportunities for many walks. We walked in extensive vineyards, on hills, unusual geological formations and loved the view of the historic houses of Gracisce in the distance. On the way to the village we had a private tasting and purchased some good Croatian wine from the Bazon Vinery. Having belonged to almost anyone in Europe in the past, Gracisce’s most important role in was as a guardian-fortress on the boundary of the Venetian Republic. Many of its buildings were built in an Italian style. They charm you with their elegance and create a wonderful atmosphere of Italian serenity. Of interest are the Salomon Palace (in Venetian Gothic style – its only example in Istria), the Bishops Palace, and several other churches. The towns’ fortifications are almost entirely lost, except for a tower and the main gates. The villa Gracisce is situated in the centre of Istria, which allows the visitor to travel to almost anywhere within a short period of time. We saw many of the jewels of Istria – Pazin, with its castle and the chasm, which inspired Dante Alighieri and Joules Verne; the phenomenal murals in the Church in Beram; Poretz, with the Byzantine mosaics. We climbed the steps to Motovun on the hilltop and loved the views from above; the Italian look of the old part of Rovinj made us remember Shakespeare; Pula and its well-preserved unique amphitheatre, Roman Gates and mosaics, delighted us. St Vincent with its large castle and Medieval Italian centre we almost missed and Opatija, a quiet resort, gave us the chance to enjoy some phenomenal sea views on a road on the side of the Adriatic. And everywhere the wine and food were excellent! This was our 3rd summer that we have spent in Istria and the first time we have stayed in this house. It was our best trip so far! The location is very good for both discovering the Istrian countryside and finding some of the best beaches that we had not visited before. The house is a fantastic renovation which retains its traditional character yet is modern, spacious and comfortable. Our kids (aged 14 + 12) thoroughly enjoyed all the amenities - badminton, table tennis, bicycles and swimming pool, and I was able to enjoy long hilly runs in different directions every morning. We had some memorable evenings in different restaurants a short drive from the house, and would definitely recommend a holiday here to our friends and family. We stayed in this beautiful house with our two young children and had a wonderful time there. The house itself is truly stunning, very tastefully renovated, with lots of attention to detail. We particulary loved the generously proportioned beautiful kitchen and living room downstairs, as well as the salt water pool and lovely garden and the quiet and peaceful surrounding areas. Its the perfect base for a family holiday in Istria being located near to the hill top towns (such as Motovun) but also not too far from the sea. We will definitely come again and can only recommend it very highly! If you have decided to spend your holiday in the beautiful region of Istria and are having a hard time deciding where to stay, look no further. Villa Gracisce is ideal. Located in the centre of Istria makes it very easy to go on day trips both inland as well to the many coastal towns and beaches. The immediate surrounding is ideal for those looking to go for walks in the hills offering stunning views. The house itself has been restored to a level rarely seen. The owners have managed to maintain a perfect balance between the history of the place and modernizing it. The amenities, in particular the terrace, garden and pool, offer something from everyone. Over the years we have spent our holidays in different houses in Istria. Villa Gracisce, without a doubt ranks at the very top and we will definitely return! Natural, wild beaches at Labin, Brsec and Kamenjak Natural Park. Resorts at Rabac, Rovinj, Porec, Fontana (30 minutes drive max). Walking and bicycle routes near the house. Airports - Pula (Croatia), Trieste (Italy), Ljubljana (Slovenia). The nearest airport is Pula, which is 30 mins drive away, with Trieste being just over an hour and Ljubljana roughly two hours, depending on border traffic. Nearest village - the historical hilltop village of Gracisce with local restaurant, souvenir shop, small supermarket. Various festivals from food competitions and wine tasting to music festivals and cycling events. Walk to Gracisce in 15 minutes past the vineyards of Bazon - one of the biggest family producers in Istria. Small shop for everyday needs located in Gracisce, along with bank machine, one cafe and a pub which serves local specialities. Long term rental can be arranged at a special rate - please contact the owners to discuss. Advance payment upon booking. Cancellation will be arranged on a case-by-case basis. Changeover Day: Flexible.